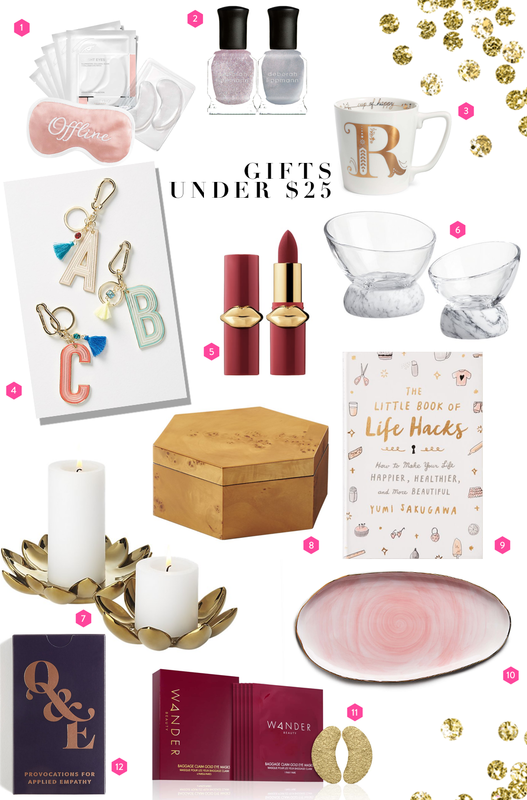 Some great gifts to shower your loved ones without breaking the bank. This eye treatment kit is the ultimate in quick luxury plus it comes with the cutest eye mask. I want to be offline always!! Nail polish is always a good idea. Everyone loves a special mug with their initial. These key chains are pretty cute. Because the packaging of this lipstick is just too cool. But really, the brand is amazing- creamy, with really rich pigments. These marble and glass bowls are super chic and so practical. A perfect gift for your friend who likes to entertain. A perfect burl wood box to decorate. This flower candle holder is perfect for a bedside or coffee table. This book is ideal for your younger friends who want to learn practical ways to organize and improve their daily life. I have one of these small platters and am just in love with it. It is perfect for easy entertaining. This game sparks meaningful conversation. And we need more of that in today’s world. It is great for dinner parties or ice breakers- Who inspires a sense of adventure within you? is one of the questions. And to this I would have to say my daughter. I want to show her all the beautiful and exciting things we have on this planet! I wish I could take her everywhere so she can experience every corner of this beautiful planet. And another eye treatment! Yes, I’m getting old and I’m #obsessed with wrinkles. I want to know about you…..Who inspires a sense of adventure within you?